Love your white pumpkins! btw, if you didn't already get it, I definitely think you NEED that diaper bag! I saw them on Rachel Ray yesterday (a black flocked print) and the said it was the best. Makes me almost want another baby! haa! He looks soooo cute!!! I love your decor, it is so peaceful and elegant, I hope you feeling better, you have to rest now, you are going to need a lot of energy!!! I can't wait to see pictures!! 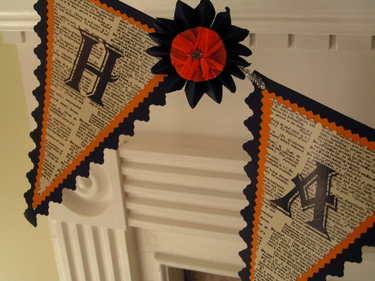 Great decor- a great to do Halloween in your style! I love the crown on the pumpkin the most! I love your front porch! I love your decorations & the tiara is perfect! Just beautiful. Sooo lovely! Your decor is just gorgeous and inspiring...I'm not a big fan of the color orange, either. Adding the tiara is such a neat idea. Thanks for sharing! Your mantle looks gorgeous!! 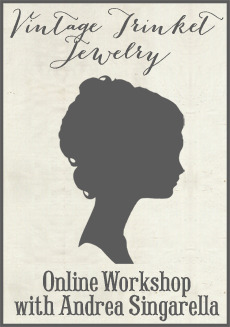 You have such a wonderful gift for decorating! That mirror is amazing! 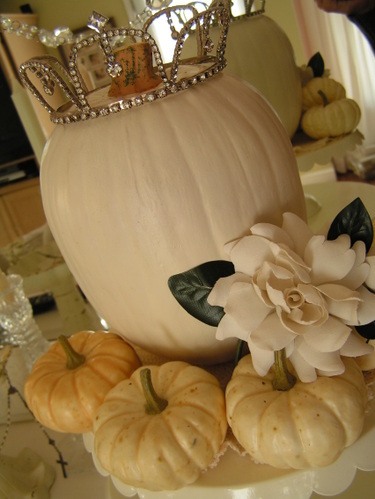 I really love the tiara on the white pumpkin! 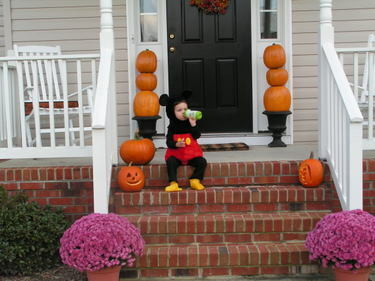 Your little "Mickey" is adorable! Happy Fall! Love the tiara......and ya just gotta love that Target store!! Very cute! 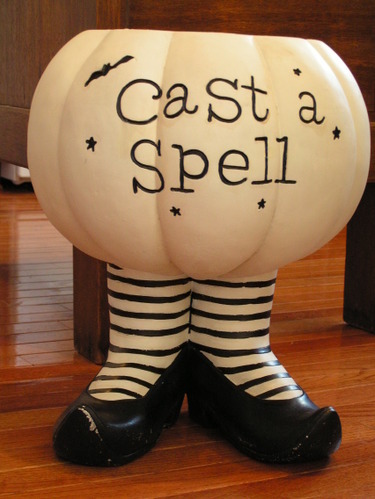 I loved the subdued colors of your halloween decorating. Lovely and subtle! Oh, I just love your mantel display - all the whites and cremes - simply beautiful!! You are a gifted decorator!!! oh my! I am all breathy over the mirror on your mantel-it is gorgeous. happy halloweenie! time I met some of the most creative and talented women ever! Oooh, I love the pumpkin topped off with the tiara - what a wonderful idea! I love your decorating style---beautiful. The collection/display on your mantel is gorgeous! Love the white on white. What a wonderful tiara on the pumpkin. Thank you so much for your kind words...I am so glad a little bit of my art has found its way into your wonderful world. I so love your white/cream pumpkin decorations Andrea! They look just too yummy! Wish I could find such beautiful pumpkins over here too. I'm so not an orange type of gal. And about Nicol I sure love her gorgeous creations! Some really lovely, delicate and inspirational displays for Halloween. I wish I'd been scouting around for some of these PRIOR to the holiday. You've also made me think an investment in a tiara is not such a bad idea! Like you, I've discovered the white pumpkin... such a nice twist on the usual orange fellows!